parents are about to have more to choose from when they purchase a Recaro child safety seat. Recaro, one of the world’s leading manufacturers of child safety seats, is combining race track safety with luxury design and color combinations to create fresh and trendy options for parents. The Hanna design features a saturated raspberry pink that fills the seat’s primary seating area. 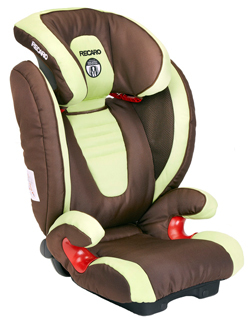 The Recaro name accents the head rest, shoulder straps, and side of the seat. Recaro will begin offering the seat around Valentine’s Day. In addition to adding a feminine option, Recaro had also received feedback from customers asking for a gender-neutral option. This is particularly useful for families with multiple children as the gender-neutral option allows parents to reuse the seat for both boys and girls as the families expand. Envy, the neutral option, features a combination of green, tan and, dark chocolate brown colors. Like the Hanna pattern, the Envy’s green color accents the seat’s interior seating area. The Recaro name is featured on the head rest area, both shoulder straps, and side of the seat. Recaro will begin offering the seat alongside the Hanna fashion in mid-February. Aside from the new color additions, parents are drawn to the company’s reputation as one of the leading manufacturers of competitive racing seats. Recaro’s child seats take design cues from the company’s motor sports seats, which are engineered to protect drivers at extreme speeds exceeding 200 miles per hour. The seats blend fresh colors with the traditional lines, silhouette, and color blocking that have made the company’s motor sports and automotive seats recognized and respected around the globe. In addition, each seat incorporates high quality fabrics that blend themselves to sophisticated colors and understated texture, such as the tan accent fabric used in the two new fashions. “Win a Recaro Car Seat “. Last date for entries is May 10, 2011.